Sayreville Station is a neighborhood in Sayreville in Middlesex County, New Jersey, United States. ^ a b "Sayreville Station". Geographic Names Information System. United States Geological Survey. ^ Google (February 14, 2015). "Sayreville Station, Sayreville, New Jersey" (Map). Google Maps. Google. Retrieved February 14, 2015. 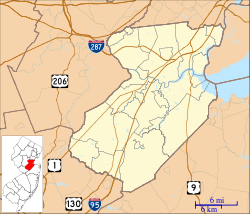 This Middlesex County, New Jersey state location article is a stub. You can help Wikipedia by expanding it. This page was last edited on 18 April 2018, at 20:21 (UTC).